We sand every day a variety of solid timber floors, floating floor, particleboard, and parquetry. We also sand old existing floors after we remove the previous coverings and we often find a suitable wood hiding beneath the old coverings. Floor sanding usually involves three stages: Preparation, sanding, and coating with desired product. All our sanding jobs are completed with specialized sanding machines, tools and equipment which allows us to work clean and without dust. By this process the majority of material is removed. The areas where we can't reach with large machines such as, edges, corners, and stairs we sand with a smaller machine called an edger. A finishing machine is then used for the final sanding. We punch all nails in which are protruding above the boards. Otherwise the nails can severely damage our sanding machine. We remove the staples or tacks which were once used to fasten previous (if any) coverings and so we reduce the possibility of damage. Some brands or types of adhesives which have been used to secure coverings may need to be removed, otherwise they would clog papers and running gear of the machines used. Some of these adhesives while present make sanding impossible. As soon as we finished with preparation we can start with sanding. The first cut is done with course grit papers to remove old products and to make the floor flat. Through that we reduce the differences in height between the boards. The large sanders are used across the grain of the timber. The areas which cannot be reached by the large sanders are sanded by an edger, as the same grit paper as the rest of the floor. If filling of holes or boards is desired this is the stage where this is usually done. Synteko Solid oil finish is an alkyd-based natural high solid oil, matte floor finish with excellent properties. It has extremely high solids (90%) and therefore gives up to three times more coverage compared to normal wood floor oil. The product is oxygen curing and provides a beautiful smooth surface with an excellent resistance to wear. Synteko Solid oil is formulated for treatment of wood and cork floors and also wooden stairs, sills, benches, decks, etc. Due to the excellent wear resistance of the product, it is especially recommended for use in commercial areas like offices, stores, museums and other areas where high wear resistance is needed coupled with low maintenance costs. We would recommend if for households with animals and heavy traffic areas. Unfortunately solid oil finish doesn't offer satin or gloss finish. It gives timber a raw, rustic look. Polyurethane water-base finish is a two-component, water-based, low-odour, non-yellowing aliphatic polyurethane hardwood floor finish for use in high traffic and commercial areas. This finish is highly desirable because it emphasises the timber's natural colour and not the coating on top. It comes in three gloss levels: Matte, Satin and Gloss. Polyurethane finish gives maximum resistance to wear, scratching, scuffing, marring and chemicals. It is, therefore, ideal for surfaces subjected to unusually heavy wear. It can be used on untreated or previously finished timber surfaces. It is a non-toxic timber floor finish, does not contain isocyanates. Modern Polyurethane finish is a fast-drying, two-component, acid-curing hardwood floor finish for interior use based on modified amino and alkyd resins in a solvent mixture. This finish has an amber colour, enhancing natural wood colours. It delivers an extremely durable, long lasting, smooth, very glossy and beautiful finish. Suitable for finishing of hardwood and other timber floors in residential as well as in commercial areas. It is self-sealing and its excellent workability and fast drying time provide the benefit of one-day job application. It is available in three gloss levels: Matte, Satin, Gloss. However because these finishes flow into the tongue and groove joint between boards and glue the boards together, when natural shrinkage occurs, boards tend to clump together causing unsightly gaps between some boards at irregular spacings or splitting within some boards. Toxic fumes contain isocyanates = are harmful to the respiratory system and are particularly dangerous for asthma sufferers. Tung-oil finish - produce subdued or semi-gloss appearance. Tung-oil is a drying oil which is extracted from the seeds of a tree. When applied, it is absorbed slightly into the surface of the timber and allows the natural seasonal shrinkage and expansion to occur without highlighting the gaps between boards. Although this finish may show marks more easily than hard surface finishes, most marks are generally easily removed with little methylated spirits on a damp cloth. Provided tung-oil finishes have not been waxed, areas which received most traffic can be recoated to restore their appearance, and these will generally blend quickly with the surrounding original finish. If the floor was waxed, the waxing process has to be repeated every year. After a the waxed surface turns dull. Liming is a type of bleaching process carried out before a finish is applied to the floor. Liming generally gives a floor a lighter, slightly milky appearance. Osmo is neither a traditional varnish manufacturer nor an eco-manufacturer but keeps the balance between functionality and ecological awareness. The binding agents of Osmo finishes are based on natural, vegetable oils that penetrate deeply into the wood and protect it. 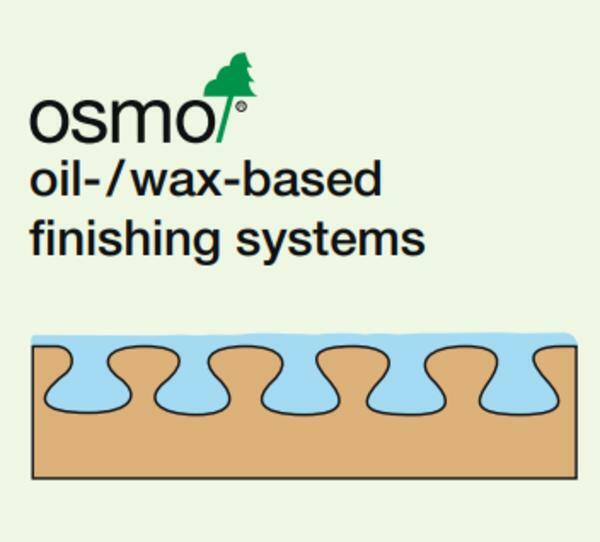 Pigments and waxes as a filler are the solids of the Osmo-finishes. They are the structural substance for the binding agent and cure the finish additionally. The wood remains open-pored and can still absorb and release moisture. Colour ?works? with the wood. In general, Osmo finishes need an absorbent surface. Wood remains "breathable" with Osmo. When renovating, cleaning the surface is sufficient in order to avoid a release film. Advantage for interior: easy to renovate - even partial renovation, e.g. in high traffic areas. Advantage for exterior: Osmo finishes do not peel off but weather over years. Thus, a new coat can directly be applied without sanding (over time the coat of paint lightens as pigments are being washed out). Prerequisite for this process is that the wood moisture is under 20 % so that the oil can net with the wood. Lacquers and thick film finishes are film-building coatings that do not net with the wood but lay on the wood surface. Resulting in a closed film that protects the surface against weathering and other influences - will be a problem as wood ?lives?. Swelling and shrinking in connection with moisture cause small cracks to develop enabling moisture to penetrate. The film surface is not sufficient for releasing the moisture. Resul: moisture damages the wood (rotting). Emerging vapour pressure loosens the colour from the wood (flaking). Treatex Hardwax Oil is manufactured on a base of linseed oil, sunflower oil, jojoba oil and alkyd resin modified with natural oil. It contains beeswax, carnauba wax, dandelilla wax and the siccatives cobalt and zirconium. Volatile components: isoparaffin, white spirit, free from aromatics. complies with regulation DIN 68861-1B: resistant to substances such a wine, coffee, fizzy drinks, tea, beer etc. complies with regulation DIN EN 71-3: safe for use on children's toys. The newest generation of water clean up wood floor finish for professionals. Oil and water-based technology gives you the convenience of water-base with the look and durability you would expect from an oil-base. All within a one component, no x-linker needed finish. ABSCO will give you the rich look of oil and bring out the beauty of your hardwood floors for years to come. When used with our ABSCO sealer, an oil like appearance is creased with this self-levelling, fast-drying system. ABSCO is available in gloss, semi-gloss and satin finishes. ABSCO provides you with an excellent self-levelling, fast-drying formula. This easy to use finish will cover 400-500 square feet per gallon. You can recoat within 2 hours and clean up is with soap and water. ABSCO is formulated to meet all the national and local requirements. This very low odour formula can be used on all job sites where interior wood needs to be coated. Our LNL-1500 Commercial Wood Floor finish incorporates superior added protection with aluminum oxide, microban antimicrobial protection, and UV absorbers in a single component non-yellowing urethane finish. The proven durability of LNL-1500 is even backed by a 15-year residential wear warranty. Our advanced waterborne formula is friendlier to the environment and features low odor, fast dry time and easy clean up. LNL-1500 is the ultimate choice for the professional. At Last-n-Last we have created a line of products with lower VOCs that are of professional quality, providing beautifil, durable protection. Our advanced waterborne formulas are friendlier to the environment, feature low odor, fast dry time and soap and water clean up. Organic chemicals are widely used as ingredients in household products. Paints, varnishes, and wal all contain organic solvents, as do many cleaning, disinfecting, cosmetic, degreasing, and hobby products. All of these products can release organic compounds while you are using them, and to some degree, when they are stored. Home is where you go to relax and spend time with family. It's not a place where you want to worry about microbes like bacteria, mold and mildew that can cause stains, odors and product deterioration. Microban antimicrobial product protection is your ally in the fight against microbes. Microban technology makes the products in your home easier to clean and keeps them cleaner between cleanings by fighting the growth of damaging microbes. At Last-n-Last we have incorporated Microban into a variety of our products. Microban antimicrobial protection is built-in during manufacturing to provide continuous antimicrobial product protection. When microbes, such as bacteria, mold and mildew that can cause stains, odors and product deterioration come in contact with the product surface, Microban protection penetrates the cell wall of the microbe and disrupts key cell functions so that the microbe cannot function, grow or reproduce. "Protects and colours your wood in one single layer! based on a revolutionary technology!" Rubio Monocoat Oil Plus colours and protects your wood in one single layer. Unlike the traditional hardwax oils, Rubio Monocoat Oil Plus will connect with the wood ply by means of a molecular reaction, as a result of which a durable protection is obtained. This molecular connection enables the Rubi o Monocoat Oil Plus to embed in the surface’s upper microns immediately. The wood fibres can only combine with a certain amount of oil. Oil, which has not reacted, doesn’t bed and needs to be removed. which require quick drying. Rubio Monocoat Oil Plus 2C is applied in one layer. Bona Naturale 2- Component Finish is the next generation of timber floor protection features the look and feel of pure wood. Imagine a system which allows you to feel the texture of the timber whilst barely changing the look of the surface Engineered without a traditional matting system Bona Naturale has a sheen level of only 6%. Walking on to a Naturale Floor you can't see the protective coating only what appears to be a raw unfinished timber floor and yet Naturale has a resistance to wear designed for commercial environments. Not only can you see the natural appearance of the wood but the surface feels like wood under your feet. The Bona Naturale system is comprised of Bona Naturale Base - waterborne and contains less than 10 % solvents and Naturale 2-Component. To achieve the look and feel of pure wood no other finishes can be used with the Naturale Products, although if a floor is to be stained Bona DryFast stain can be specified. Bona Traffic is two-component non-toxic waterborne polyurethane timber floor finish with an excellent resistance to wear. Recommended for high traffic domestic and commercial areas such as restaurants and retail outlets, Traffic is available in two gloss levels - satin and special matt look called "Invisible Protection" (IP) which highlights the natural beauty of the timber without distracting shine and reflections. Traffic is suitable for re-coating most existing surfaces including pre-finished timber. When coating bare timber Traffic should be used in conjunction with Prime Intense or Classic.